IRELAND NUMBER 6 WORLD CUP SHIRTS. The Republic of Ireland are going to the show again after missing out in France 98 and the World Cup will be the better for it. The team quailfied by beating Iran in a 2 leg playoff after finishing 2nd in their qualifying group behind Portugal. The group included Holland who didn't qualify . Led by manager Mick Mc Carthy who was Irish Captain in Italia 90 and the new skipper Roy Keane the 'Boys in Green' will do battle with Germany, Cameroon, and Saudi Arabia in group E for the first round. The first round will be played in Japan. The Germans and the Irish are the favorites to go through to the next round however the Cameroon could be the dark horses. 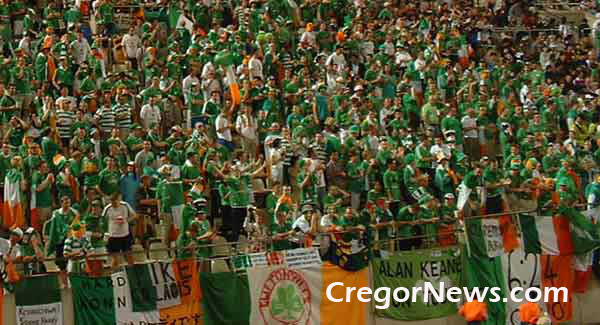 The Irish can expect support from up to 10,000 traveling fans from Ireland as well as those traveling from other corners of the globe. The fans have followed the team around the world and unlike the english are welcome anywhere. The favourites for to lift the cup this time are Brazil and Argentina, while France or Germany would be the strongest European teams. The Cameroon wrapped up the African Nations cup this week beating fellow World Cup qualifiers Senegal on penalties. The final played in Mali was scoreless after extra time. The Republic of Ireland played Russia in a friendly at a freezing Lansdowne Road in Dublin Wednesday and won 2-0. The goals came in the first half from Stephen Reed and Robbie Keane. These 2 sides will face each other in the Euro 2004 qualifiers so it was a good result for us. The Germans beat Isreael 7-1 in their friendly and left Palistenians smiling for days. Ireland ground out a result on a water loggged pitch in heavy rain on Wednesday to continue a good run of results. They beat the USA 2-1. Mark Kinsella opened the scoring for the Irish before the Americans equalised through Eddie Pope before half time. Gary Doherty scored the winner for Ireland after coming on as sub. Germany were beaten by Argentina 1-0 and The Cameroon were held to a scoreless draw by Austria. Ireland Captain Roy Keane didn't play after being injured playing for Manchester United, but he is expected to be fit for Japan in June. The country wishes him a good recovery. The Irish rounded off their pre tournamant warm up matches with a defeat to Nigeria on Wednesday. The Nigerians out played Ireland and led 2-0 at half time. Stephen Reid pulled a goal back for the home team in the second half. It is hoped that Nigeria can play as well against England at the World Cup. Germany lost 1-0 to Wales in Cardiff on Tuesday night in their last game. Manager Mick Mc Carthy showed today that he's nothing but a bag of shite when he sent home Irish captain Roy Keane for complaining about conditions in Saipan where the team have been staying on route to Japan. Captain Keane was doing his job pointing out the stinginess of the FAI in failing to spend money on the players and team that qualified for the World Cup. The chance for Ireland to do well at the finals was all but eliminated with this absurd decision. The most experienced Irish players left in the squad (Niall Quinn, Stephen Staunton, and Alan Kelly )showed themselves to be 2 faced in the aftermath of the witch hunt which was typical 'mc carthyism'. The 3 along with Mc Carthy have shamed themselves and Ireland.